Disclaimer: This recipe was created with product received from Chef Shamy as part of #CookoutWeek. All opinions are my own. 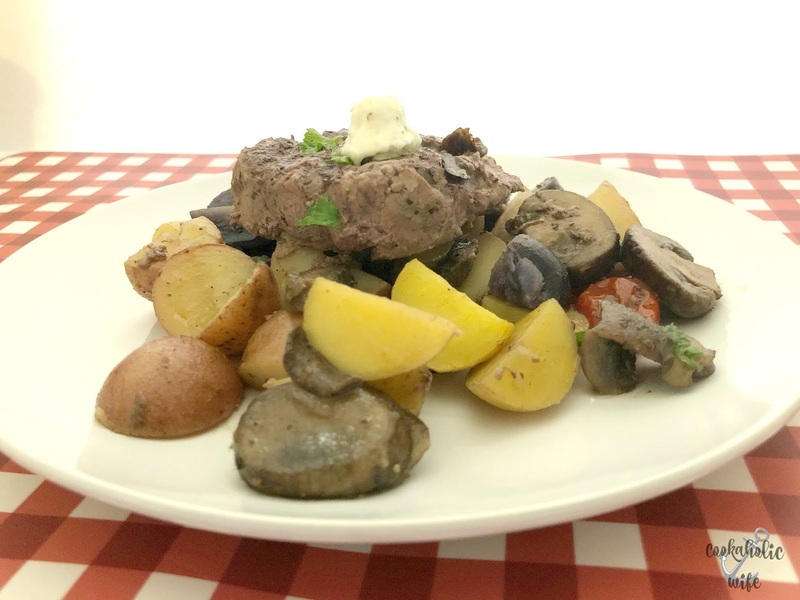 You step outside into a warm summer night, a gentle breeze blowing that picks up the scent of charcoal from a lit grill, followed by the scent of garlic, vegetables and beef. Is there anything better than that? Tom and I have done more grilling in the past 6 weeks than I think we did all of last summer. I love it! Not just because of the awesome smell that food cooking over charcoal puts off, but because aside from prepping the food, I just get to sit there while Tom does the rest. As someone who cooks on average 5 nights a week, every week, I consider these grilling nights a glorious vacation from my kitchen. 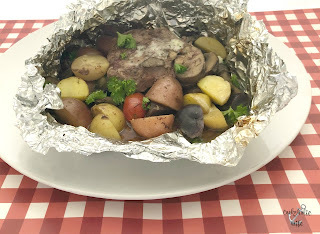 Foil packets are one of the easiest types of dishes that you can grill. Everything gets prepped and put into the packet, you sit it on the grill and come back when it’s done. 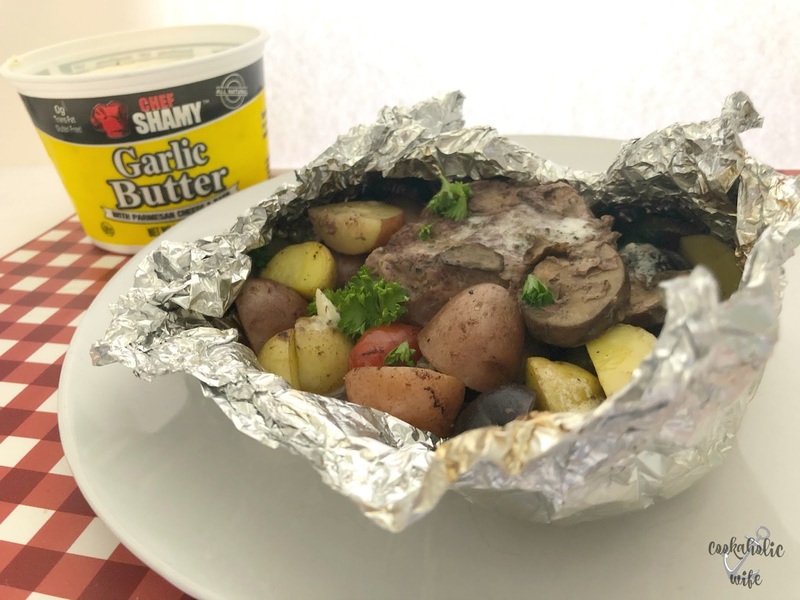 You can either plop the packet right on your plate and eat out of it, or slide the ingredients onto your plate and toss away the foil. Clean up doesn’t get much easier than that, does it? We were talking of going camping at Assateague Island this fall and of course, the first things that I started to think of were meals to make. Unfortunately there wasn’t a date that worked for everyone but we’ve decided we’ll push off those plans to the spring. Which for me just means more time to find recipes to have while we’re there. Foil packets are perfect for camping because you don’t need platters or plates or really even serving dishes. Steak, potatoes and veggies covered in garlic butter are cooked in a foil packet for a no-mess dinner great for those busy weeknights or when you’re on a camping trip. 1. Rip off 4 pieces of heavy duty foil, about 12 inches long. 2. Add the potatoes, mushrooms, bell pepper and onion to a bowl. Season with 2 tablespoons of steak seasoning. 3. 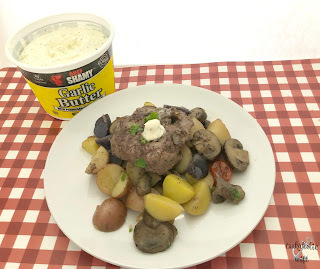 Melt 4 tablespoons of Chef Shamy Garlic Butter and pour over the vegetables. Toss to coat. 4. Divide the vegetables evenly between the foil packets. Season both sides of the steaks with the remaining steak seasoning. 5. Place the steaks on top of each vegetable pile, then place a tablespoon of butter on top of each. Fold up the edges of the foil to create a packet. 6. 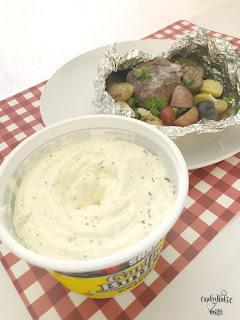 Grill for 30-35 minutes or until potatoes are fork tender. 7. 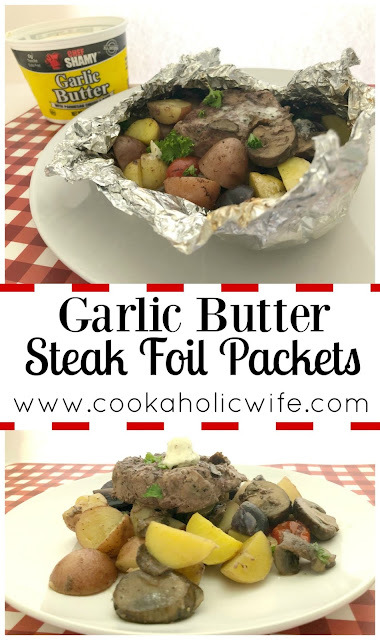 Carefully open the foil packets to allow the steak to escape and season with additional salt and pepper to taste. Garnish with parsley. Note: Instead of a whole steak you can also cut the steak into 2-inch pieces. Talk about delicious! Our stomachs were growling the entire time this was on the grill, impatiently waiting for the potatoes to finish cooking. The garlic butter melts down into the steak and further coats the potatoes and veggies making it simply unbelievable. Their slogan is Make the World a Butter Place®. Which after using it, I feel like is a totally accurate slogan. Their butters contain no oils and the savory ones can be used in keto recipes. They also boast a shelf life of up to 2 years when frozen, but can be kept in the refrigerator for 6 months and some flavors are even shelf stable. But good luck on keeping this butter around long enough to hit any of those shelf lives. And because they’re really awesome, they’re offering everyone a 10% discount off their butters by using code 10BUTTER10. This code only works until July 4th so head on over to Amazon and make sure to order yours soon! And don’t forget to enter the giveaway hosted by all of our awesome sponsors! Love those packet dinners too Nichole. This one looks fabulous. My husband would eat steak every day if I'd let him. I love that this is made into a packet dinner!